Want an alternative to the endless debate between faith and atheism? Krish Kandiah offers you an alternative to arguments, and a challenge to see people as they are. Want a new approach to the faith / atheism debate? This passionate and challenging exploration of the Faith vs Atheism debate asks the biggest question of all: What if everything you think you know about fAiTHEISM is wrong? Over the past decade the Religion vs. Atheism debate has generated a lot more heat than light, with passionate advocates for both sides snarled up in antagonistic claim and counter-claim. In fAiTHEISM Krish Kandiah asks us to take a long hard look at ourselves - and a more understanding look at each other. When we step away from the arguments for a moment and consider the real people on each side of this debate, he argues, we will discover that we share more than we realise. The desire to know the truth is in itself a uniting factor, even if we have reached different conclusions, and in testing our own assumptions, Krish contends, we can both grow in our own beliefs and understand each other better. 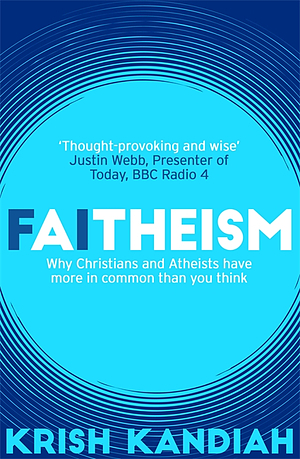 In this challenging exploration of the myths about Christianity and Atheism, Krish draws on his experiences with the adoption charity Home for Good that he founded - on the one hand explaining the adoption and fostering process to churches and on the other, helping local authorities to understand where churches are coming from - to question the most common assumptions about Christians and Atheists. Time and again the evidence shows that the truth on the ground is not what one might expect - and the potential for genuine understanding is far greater than the antagonists on either side would have you believe. What if, by believing the best about each other, we could achieve the best for ourselves? What if the truth really can set us free? Faitheism by Krish Kandiah was published by Hodder & Stoughton in July 2018 and is our 6557th best seller. The ISBN for Faitheism is 9781473648944. Be the first to review Faitheism! Take a peek at some articles related to Faitheism. Got a question? No problem! Just click here to ask us about Faitheism.